We SEE YOU week 3! And you’re only giving us mild panic attacks because deadlines don’t stand a chance against Team KPV! [insert hyperventilating cries here]. 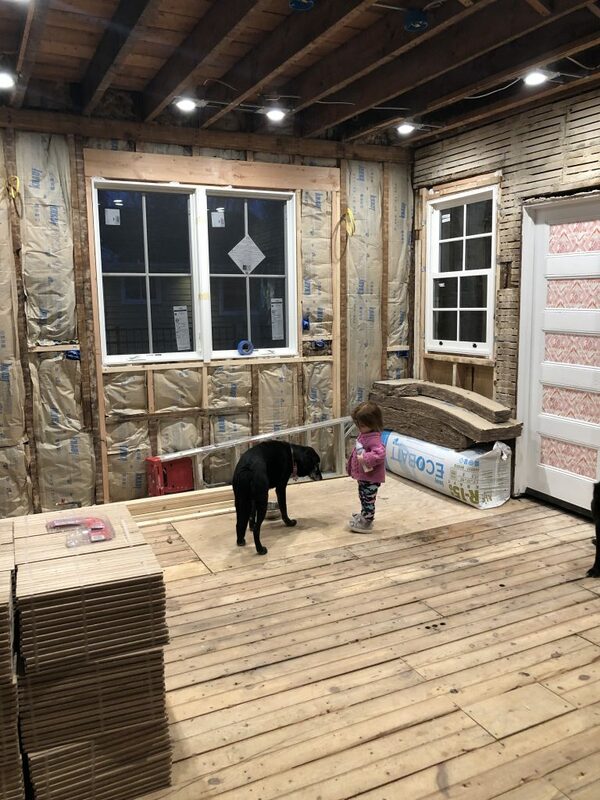 As always, be sure to check out the progress of all of the other incredible room transformations over at the One Room Challenge! This week I want to talk a bit about materials and give you a sneak peek of our floor. Then I want to take you through the first steps of the construction process post-demolition. 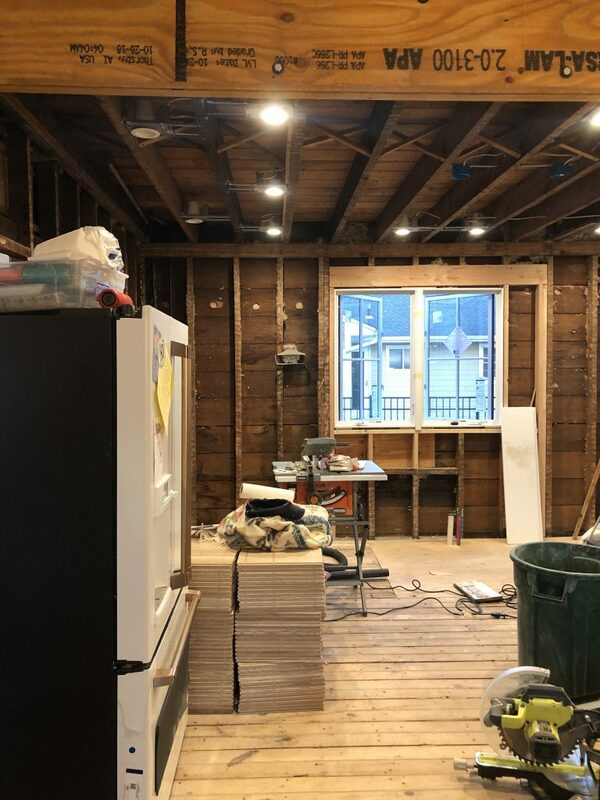 We were super lucky to hook up with some amazing sponsors for this kitchen renovation, and I need to be perfectly candid with you about how they came to join us on this journey. In short, we chose THEM, not the other way around! So when I tell you they kick so much a$$, I want you to really believe me. 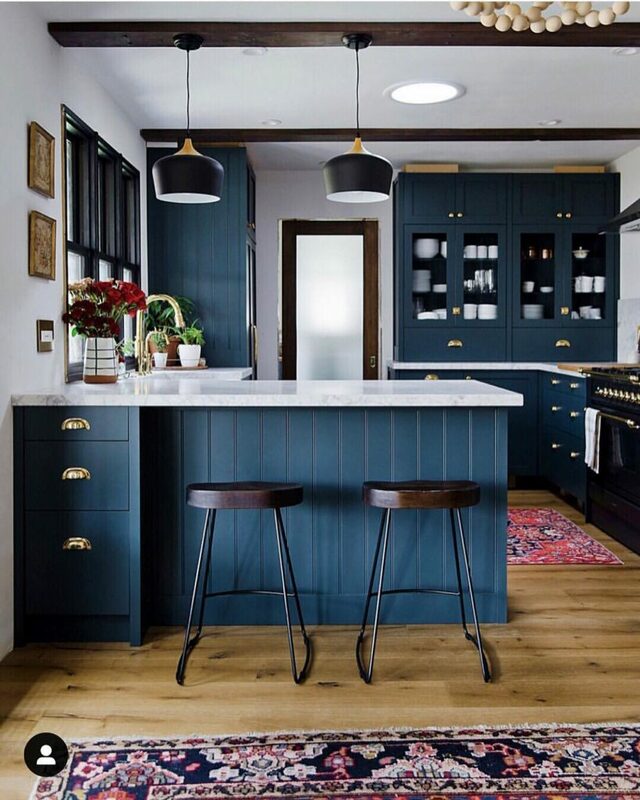 As I mentioned in the previous post, the first part of the kitchen that was chosen was that dreamy blue stove and we were so grateful to get Hallman to come on board as a sponsor to make that stove even more special with some great features. So, consider this stove as our jumping off point for the rest of the kitchen. 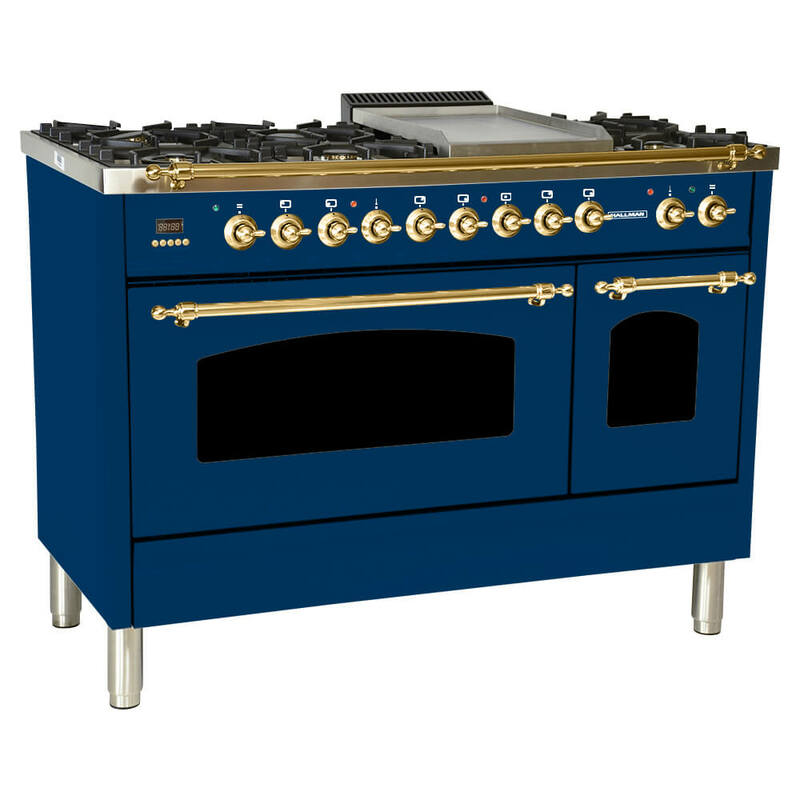 I have spent the 17 years of my adult life dreaming of kitchens, and the first thing that always came to mind when dreaming was that statement stove, but did that mean that every other element in the room would have to bow down to that splash of blue? Hell to the NO. The next crew to come on board was Boho Luxe Home. I had worked with them and their gorgeous pillow line before, and I was beyond excited when they offered their stunning fabrics for our Roman shades. We put a lot of work into the windows in this space by not just adding completely new windows and new locations for them, but by more than doubling the size of our main window. It was so important to us that this kitchen was bathed in as much natural light as possible, and we wanted to draw the eye to this element, and balance that blast of blue in the stove with another gaze-attracting feature. We decided to go with their Moroccan Knot fabric, and I am super stoked to see them completed when they get installed next week! So, bright blue stove, wild Moroccan fabric…. now where do we go? 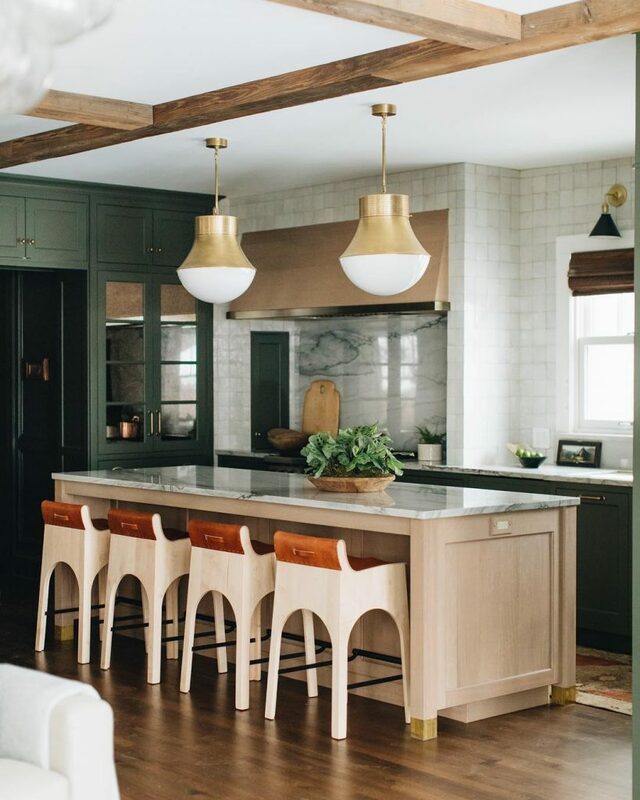 My overall vision for this kitchen was to have some strong boho eclectic vibes, but there are so many directions to go beyond that point: gold glitzy ritzy eclectic? Or earthy, hippie boho? I love both of those extremes so much, so I wanted to try to meet somewhere in the middle. If I could choose a single sentence to define my entire interior style, it would be that I don’t like settling for ANY single style. The main challenge is making totally disparate styles work together in a cohesive way. And that, in a nutshell, is what this kitchen is striving for. Our next sponsor, Build.com, helped us add a little bit of that glamor I speak of. We decided to go with a brushed gold faucet, with a matching pot filler, to pull from those brass elements on the range, and to add a touch of high class to the space. We chose the Moen line for their stellar track record and their beautiful finishes. We can’t wait to see them installed tomorrow! It was at this point in the process that I decided to step back and really take a hard look at the direction I wanted things to go. I am NOT someone who plans an entire space in a CAD program before breaking ground. That just doesn’t work for me. I always start a room by choosing the element that is most important to me (perhaps a bed frame in a master bedroom? or a rug in a living room?) and then I work from there. I find it to be a much more organic process, but the downside is it takes much more time. I like to SEE certain features in a room before adding to the layers. And oftentimes, inspiration comes from a visit to my local thrift store, and not from a West Elm catalog. The unpredictability of the process is what excites me most about designing spaces. Although I wasn’t able to visualize almost any elements before having to choose nearly all of them, I was still able to move through the process by being intentional about every step, and decided to add layers in the order of what was most important to me in the room. I knew I wanted those glitzy fixtures, but in order to counter those pops of gold, that bright fabric, and that fancy stove, I knew we needed to tone it down somehow. In order to achieve this, we decided to add some authentic reclaimed wood to the room. I love the versatility of wood, and it can really work in almost any type of space. I’ll get more into how and where we decided to add these touches of reclaimed wood next week. For now, I’ll let you know that we decided to go with a dark, sumptuous stain to allow the wood to dance alongside those more glamorous elements, all the while allowing the rusticity of the wood itself to make the entire space more approachable. This was about where we stood half-way through the process on the design end, so now let’s chat for a moment about what started to evolve on the building side, post-demolition. Once our two month (plus)-long demo process was complete, we needed to sheetrock the entire space (ceiling included). 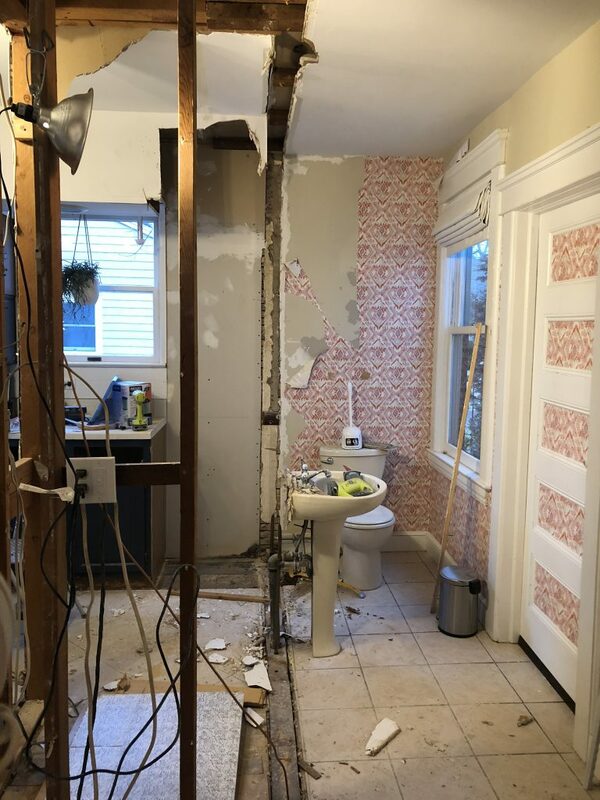 As I had mentioned in the last post, the entire space was plaster and lath, and we opted to tear all of it out to make the electrical work more seamless. Now, this is where we struggled a bit being an essentially one-man team. Billy (my builder hubbie) did not have the proper equipment or man power to sheetrock a ceiling, so we decided to give the man a well-deserved break and hire this one out. Our contractor did an amazing job bringing this room back from the dead, and we were finally able to take a few deep breaths after seeing the walls and ceiling replaced in the room. 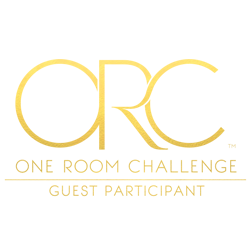 The next obstacle? FLOORING. Now, these floors are possibly my favorite element in the room, while my husband has come to abhor them after they took an obscene amount of time to install. 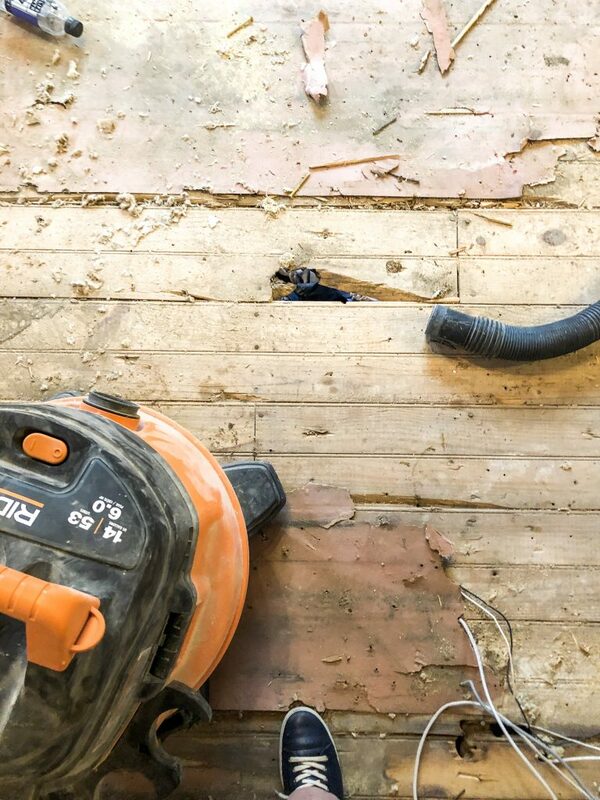 I might remind you that we had three layers of floor to demo before reaching our subfloor (which needed major repairs), so finally seeing a beautiful floor under our feet was INCREDIBLY rewarding. 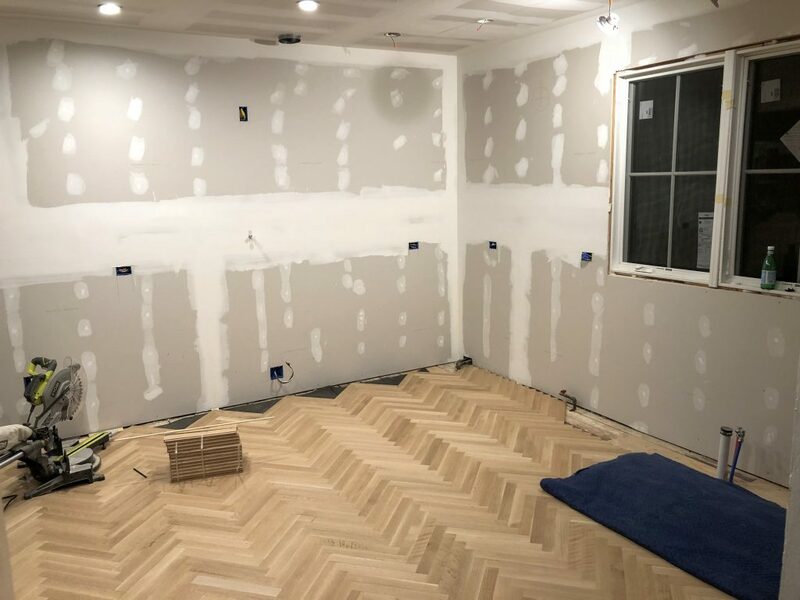 And I have to give a MAJOR MAJOR shoutout to the hubs for making my herringbone floor dreams come true. I was a big brat about the floor. It was herringbone or the highway for me, and he didn’t even argue because he must have just known how amazing they were going to look too (love yah babe! 😉 ). So, this is about where we were mid-construction and mid-design, and we had all kinds of wonderful and terrible surprises in store for us in the coming weeks…..
Hayyyy ORC – WE’RE HERE! 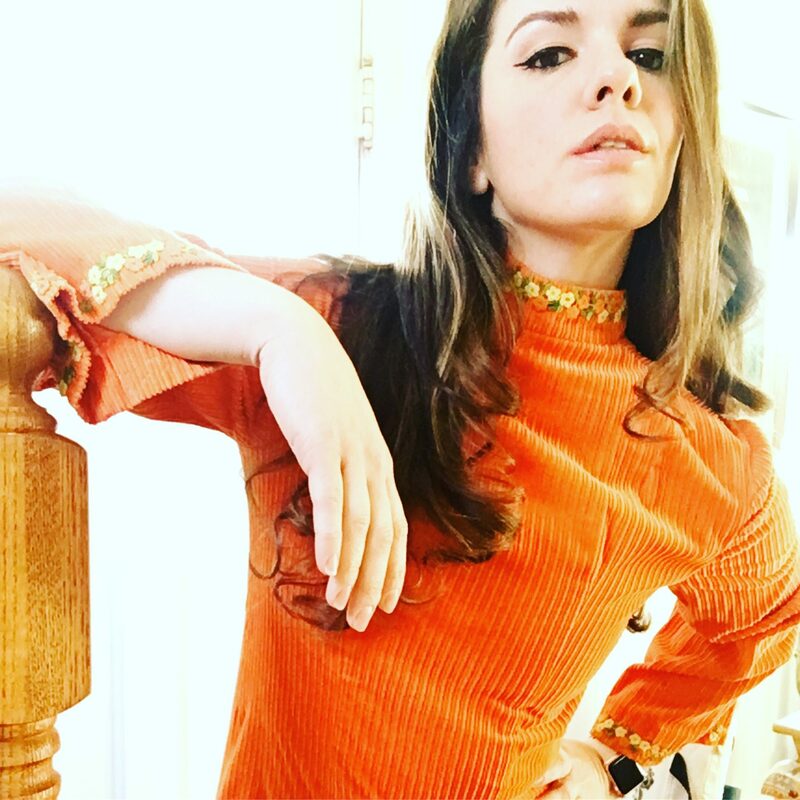 The crew here at Kate Pearce Vintage is diving in head first to the Spring 2019 One Room Challenge and we couldn’t be more excited. This is our very first ORC and we’re not just dipping our toes in this round, we’re going BIG. 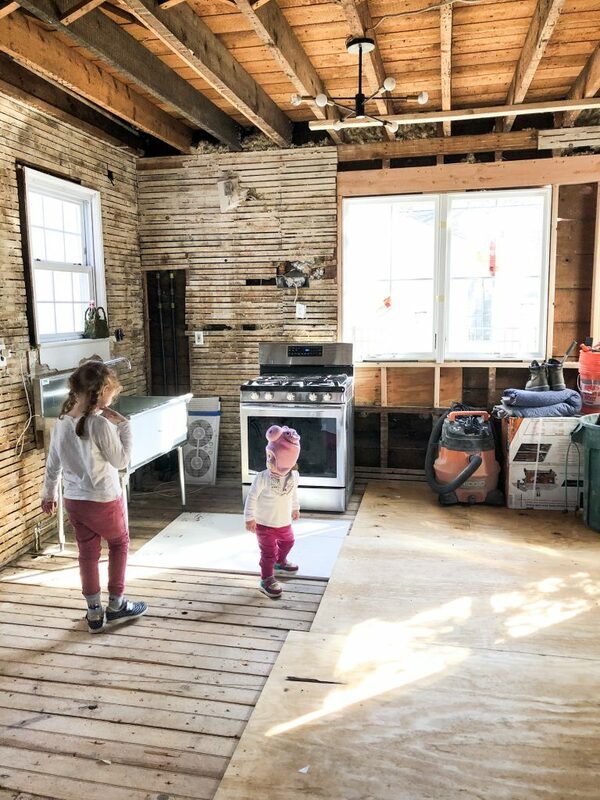 We’re gutting our 1980s kitchen to the studs and building our dream boho kitchen – and for those of you who aren’t new around here you know that will mean lots of color, texture and, you guessed it, VINTAGE vibes. Because we all know vintage is the name of our game. 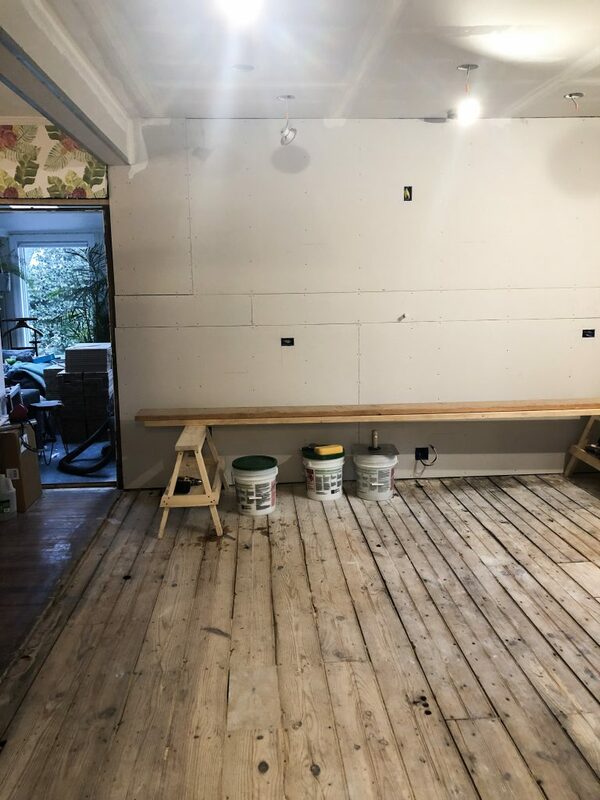 As you may have guessed, taking a kitchen down to its studs and rebuilding from scratch is a task that takes more than five weekends (we’re a husband + wife duo who work Monday-Friday), so we’ve started a bit early and are crossing our fingers to be done by reveal day. We’ve teamed up with some fabulous sponsors for our project and are just itching to show off their beautiful products – Riad Tile, Boho Luxe Home, Build.com, Hallman Industries and Wallternatives are all along for the ride. 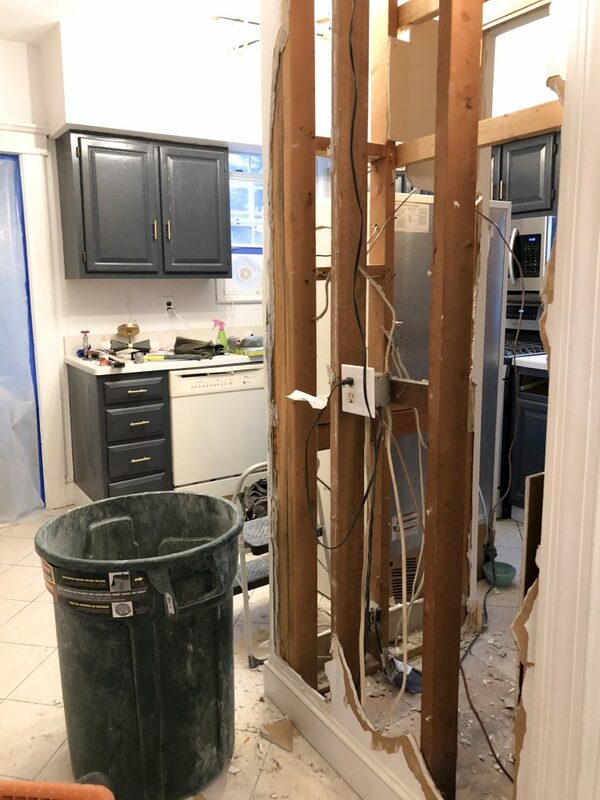 SO – what’s this kitchen going to look like? We’ve pinned more than 75 kitchens on Pinterest and another 100+ are saved in our I-Phone “Kitchen Inspo” folder. More than four months have been spent agonizing over where to begin, HOW to begin, and where we want to end. We’ve sucked inspiration from so many beautiful Instagram squares, including these two from Jean Stoffer Design (Left) and Beginning in the Middle (Right). 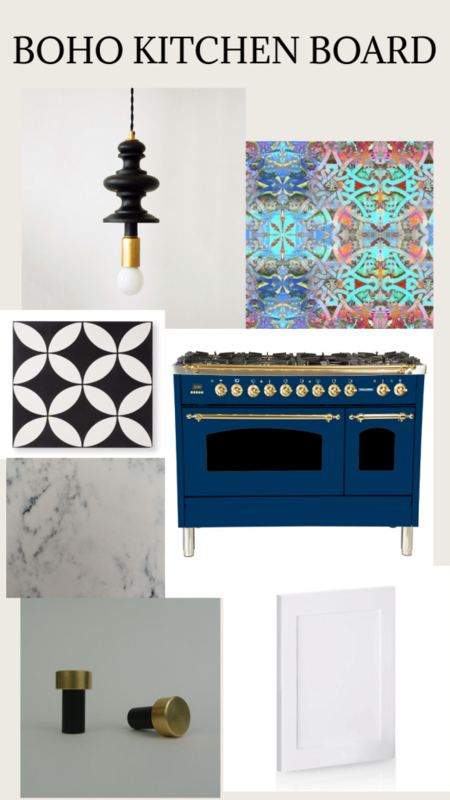 And the more images we saved, the more we noticed themes beginning to emerge: BLUE, matte black and brass accents, statement stoves and bold, graphic patterns. We also just fell HARD for calcutta marble. But out of all of those things, the piece that caught our eye the most in kitchen after kitchen….. after kitchen.. was that statement stove. So, we ordered a 48″ cobalt blue Hallman range and used that as our starting off point for the rest of the kitchen. We’re loving the current trend of mixing metals, and this Hallman range hit all the marks for us: that bold blue color, with brass and stainless steel working together to prove that two metals are just so much better than one. The biggest challenge for me, as a designer, is to balance bold with a cohesive composition. I love taking a viewer’s eye to different elements of interest around a room, but the room still needs to work together. I like to think of it as the Kardashian effect: each player steals our eye for a moment, but the overall picture is even stronger than any one element on its own. It’s for this reason we decided to go with your ubiquitous white shaker cabinet. 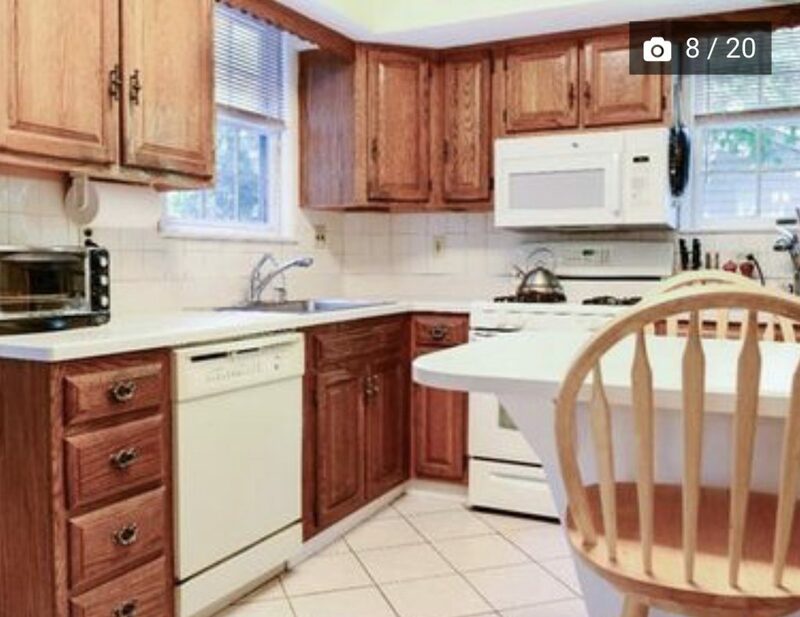 With bold roman shades, graphic black and white tile, and a statement stove, the cabinets just HAVE to blend and not shout, otherwise we’d almost certainly have more than a few offended eyeballs on our hands. Now that you have an idea of where we are GOING with the kitchen, I think you’d better be clued in to where we began. The photo above is how the kitchen looked on move-in day in June of 2017. 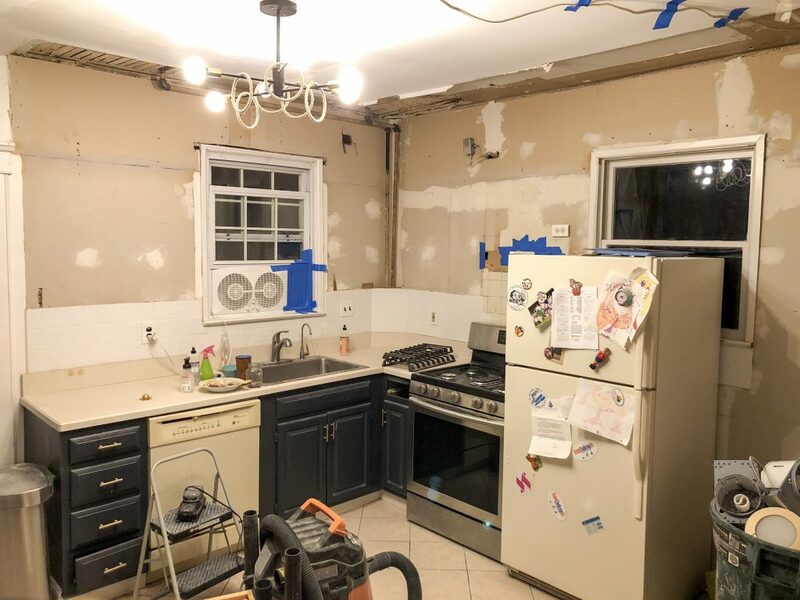 We knew we’d be gutting the kitchen in short order, so we didn’t bother to do much, but I did get some 50 cent hardware off Amazon and I painted the kitchen cabinets a deep blue. Overall, though, this is very much what the space has looked like. Just to the right of the kitchen there was a powder room that we demolished during week 1 of construction to make more space for the kitchen. 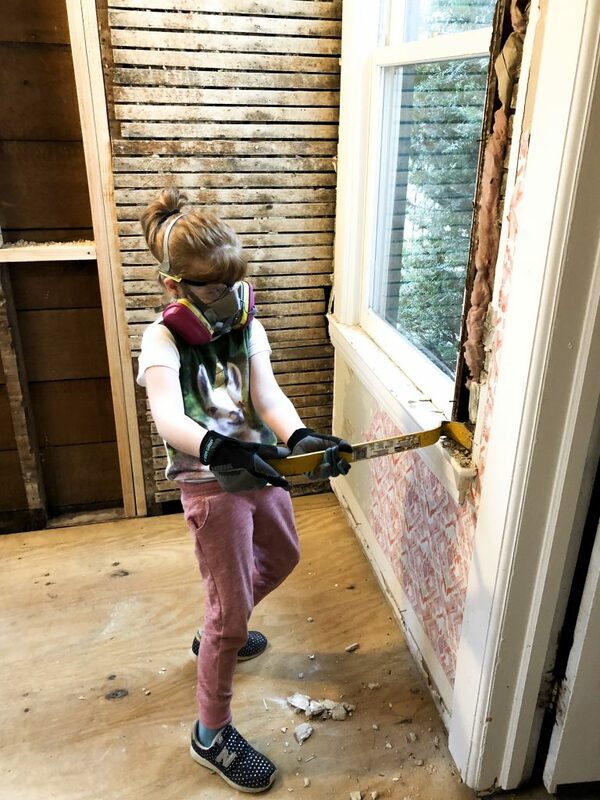 We are also removing the wall between our kitchen and dining room to make the space feel more open, and replacing windows and doorways is also in the plan. This has been an enormous undertaking, but we’re really just so excited to see the final outcome. We hope you are, too.